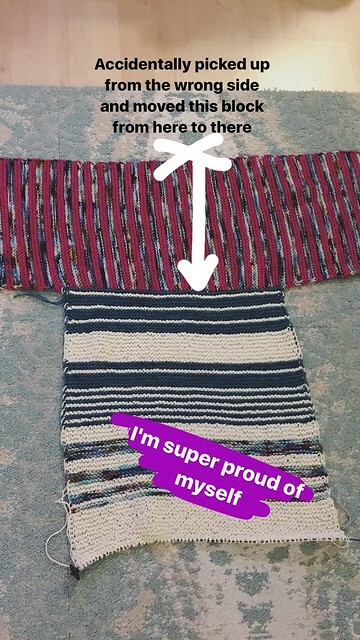 Before we left for our vacation to Savannah I started on my Royally Striped Cardigan. I should’ve taken the dress for my goddaughter that has a billion miles of stockinette stitch but I just didn’t want to do it. 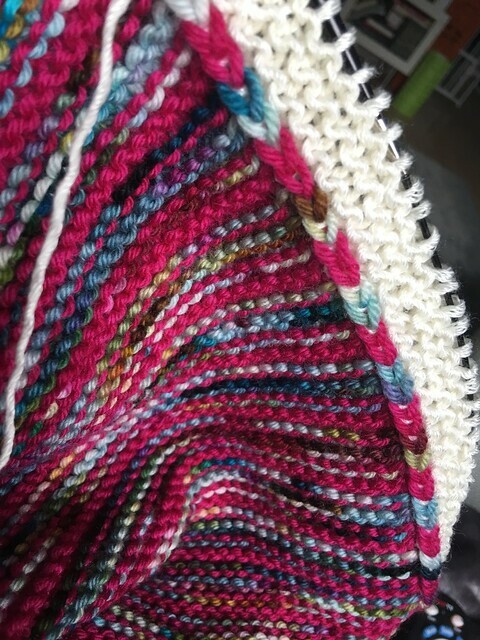 So I started on Royally Striped instead. I always think, oh this will take me a while to make and then something about the pattern will excite me and I plow right through it. Before we started our road trip I started about this much of the first section to create the cardigan. 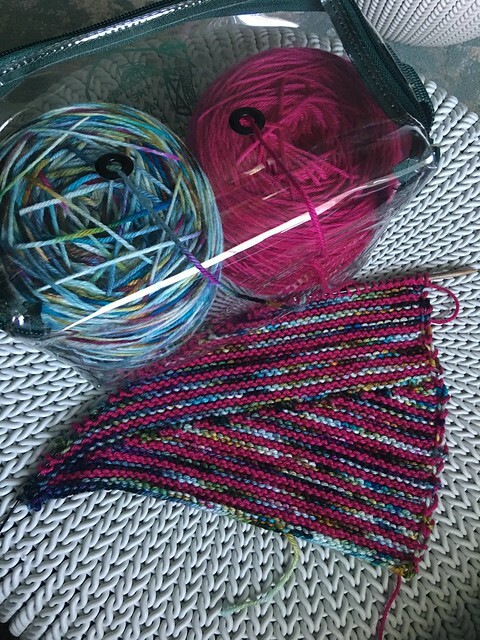 What I love about this project is that you can use up a lot of single skeins of dk weight yarn you might have, the color combinations are endless and it’s nice and mindless garter stitch with a few basic short rows (without the wrapping – hooray!). Added bonus I finally figured out a project where I could use my Hikoo Abracadabra color changing yarn I bought ages ago. This is a great car project in the early stages and a great end of the day winding down kind of project to work on too. This is a little bit more progress I was able to make in the evenings in our hotel. I loved our hotel because they had these amazing green chairs with huge ottomans in our room so I had a perfectly cozy knitting spot. And the end of every row you slip one stitch with the yarn in from (SL1 WYF) and it makes it super easy to ensure you’re picking up the correct amount of stitches around the edge. As much as I love picking up stitches I’m horrible at getting the right number. This time I got my numbers right (isn’t the inside just beautiful?) but unfortunately I picked up my stitches on the WRONG SIDE. Yeah, you read that right. But I didn’t panic! And you might have seen this on my Instagram Stories. I realized as I was at the end of this massive block on the back and was going to need to do my side pieces next that I did indeed pick up from the wrong side. I was a little confused and had hoped the pattern would’ve had a better picture for my brain to grasp where to pick up but it didn’t so I did what I thought was right and it was so wrong. 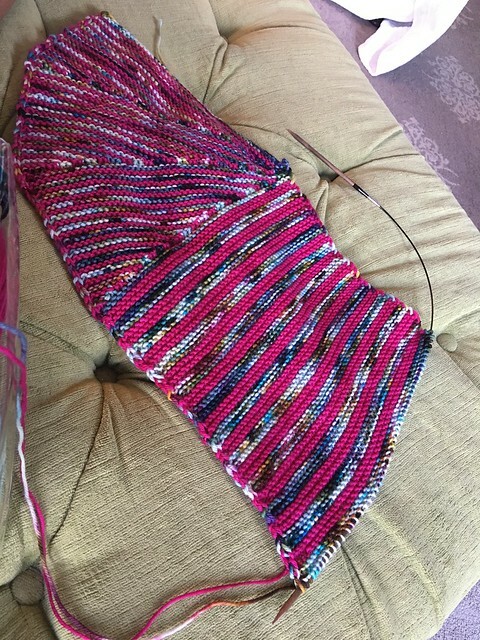 So instead, my solution was to pick up stitches on the correct side and then use the side I hadn’t finished yet to do a three needled bind-off to attach it. My color block is upside from where I wanted it but I was able to flip it without a problem. I was also able to easily unravel the other side where I picked up stitches and put the correct amount of stitches back on my needle. I was so proud of myself. Now I’m sure there are other ways I could’ve worked this out but I don’t care! LOL I worked this one out on my own with lots of success. All that’s left is the border on both sides, two different colors and the short sleeves. But I love that it has armholes and a shape so I can actually put it on. I’m super excited to see this as a final project and cannot wait to see the yarn truly change color in the sun. The only problem? I’ll have to wait until fall to really wear it but whatever, it gets cold in my house in the summer with the AC on, right? That’s a HUGE accomplishment!!!!! Congratulations!! I did initially panic but took a deep breath and said you have to figure this out. I did not want to redo all that work. So glad I was able to fix my mistake. hahaha! That’s awesome! You saved it!!! 🙂 Never call me out on my mods again . . . although it wasn’t a mod, the same principle applies! You did what you had to do to make it work. So proud of you that you’re coming out of that box, DWJ! You’ve grown by leaps and bounds! This will be 3/3 for out of the box, since you’ve designed 2 (was it 2 or was it 3? ‘A Spring Tee, Eden, and ???) of your own sweaters recently 🙂 AWESOME!! I’m trying to grow and not let fear paralyze me! I panicked for about 10 seconds and then said wait, just think this through. You can fix it.